Apple’s personal assistant Siri has been updated with support for sports ahead of the World Cup in Brazil, Russia, Denmark, Finland, Malaysia, Turkey, Saudi Arabia, and Israel, Apple announced today. Sports support for Siri in the nine new countries expands Siri sports information to a total of 35 countries, including the United States. In addition to expanding Siri sports support, Apple also plans to highlight football (soccer in the United States) apps and games throughout the month. Features will include tips on taking the perfect football photo and how to “get your football fix” on social media. Highlighted apps will include FOX NOW and BBC Sport, while featured games will include FIFA Mobile and PES 2018. The TV app on Apple TV and iOS devices will feature World Cup coverage via FOX NOW in the United States and TSN and RDS in Canada, with fans able to follow their favorite teams through the TV app’s Up Next feature. Apple also plans to feature World Cup content in the News app through Eight by Eight magazine, and in Apple Music with featured playlists for each of the 32 participating nations. 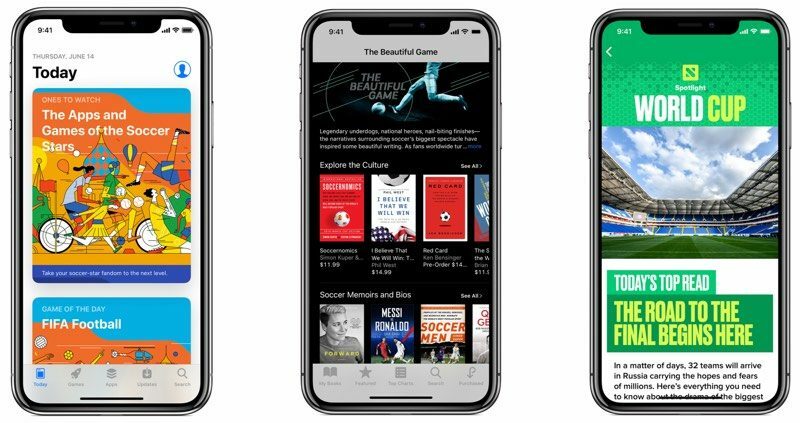 Podcasts will include a “The Beautiful Game” World Cup editorial collection, as will iBooks, with Apple highlighting World Cup-related podcasts and book selections. The 2018 FIFA World Cup kicks off later this week on June 14 and lasts through July 15.